If anyone knows how to tackle the cold weather without compromising on style, it’s Kerrie M. Burke. 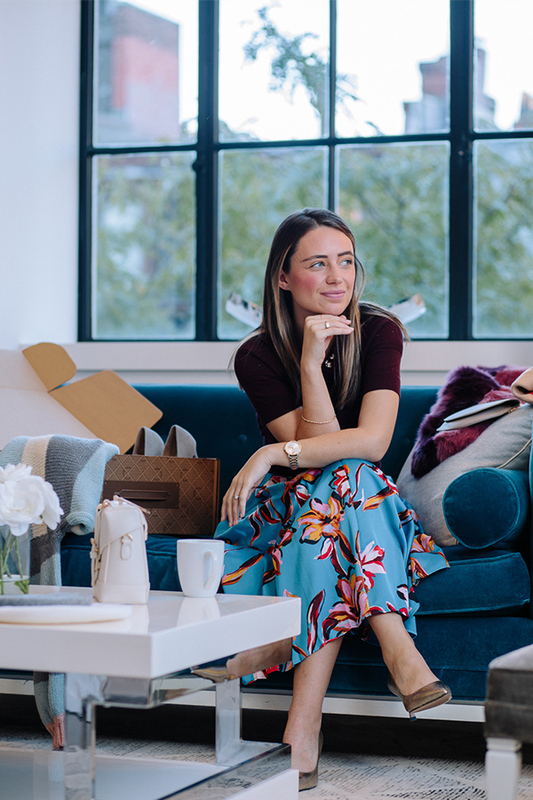 Kerrie is a lifestyle-blogging Galway gal living out her American dream in Boston, where she brings us the best in flowy, feminine, and fun-loving style. 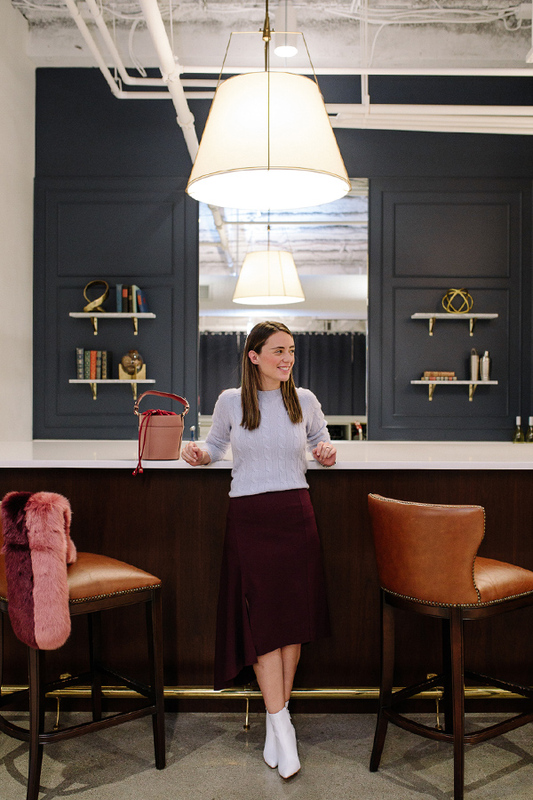 We love The Life + Style of Kerrie M. Burke (her ultra-fab blog), so we were thrilled to have her come out to our Boston Clubhouse, bottle up her outfit magic, and curate a series of looks we’re excited to share with all of you. Keep scrolling to see what Kerrie pulled together for her signature Trunk. When the cool weather hits, you may think it’s time to put away the florals and flowy fabrics—not true. As Kerrie shows us here, a colorful skirt can be seasonally appropriate for fall when paired with a top in a moodier shade. Her garnet sweater with embellished collar pulls from the deeper colors in her skirt, tying everything together. Her metallic shoes function as a neutral in this look, while adding a welcome bit of shine. We’ve already proclaimed our love for pastels and textures this season, and Kerrie is following suit. Her classic cable knit sweater stands out in lavender, especially when paired with a sleek and demure midi skirt. And the white ankle boot? So glam, so fresh. Winter white is one of our favorite ways to add an unexpected pop of brightness to an otherwise cool-weather color palette. Depending on where you live, your fabric selection matters. Kerrie resides in Boston where the New England chill is no joke, so a roomy turtleneck in soft colors is the perfect way to stay cozy. She balances the volume of the sweater with a skinny jean and pump, giving it her signature feminine spin. To top it off, her grey wool coat has a great detail—check out that collar. A shock of bright blue is just what we need for gloomy fall and winter days.